Kanapitsa. In a distance of 6,5 kilometres from the city of Skiathos is found the peninsula of Kanapitsa with many hotels, very beautiful rural residences and beautiful beaches, in an almost closed and always calm sea. Agia Paraskevi. Clean waters, golden thin sand. This is the beach of Agia Paraskevi, which took its name from the small church that is found there. 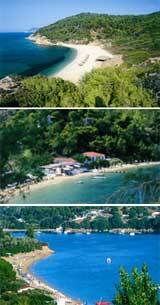 In this beach are found luxurious hotels, taverns and also all sea sports. Agistros. It is a beach in the north of the island, with sand and relatively deep waters. Astonishing is the way to the beach Agistros, as the visitor has to cross the beautiful forest of Mandrakiou in order to get there.